The original C-Shel, was a 1989 Tollycraft 34 Sport Sedan, a freshwater yacht, lovingly cared for and serviced. 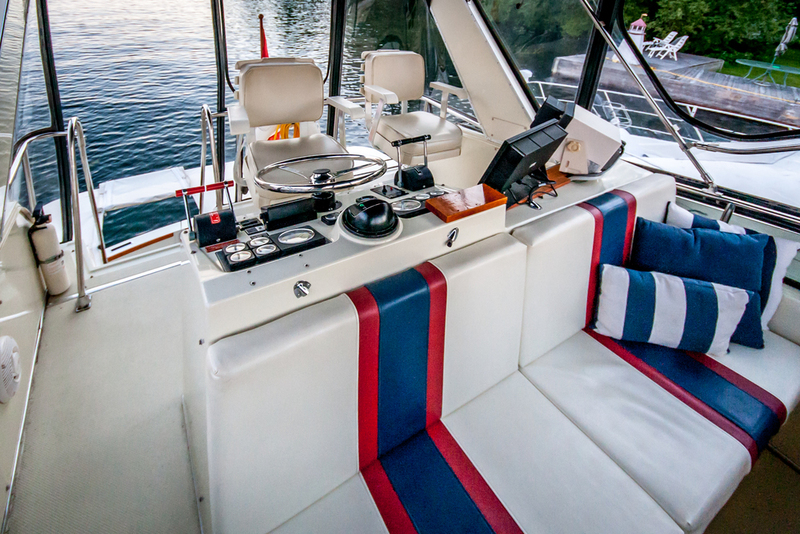 She is a well-styled sedan cruiser with an impressive blend of quality construction, comfortable accommodations, safety, and good open-water performance. 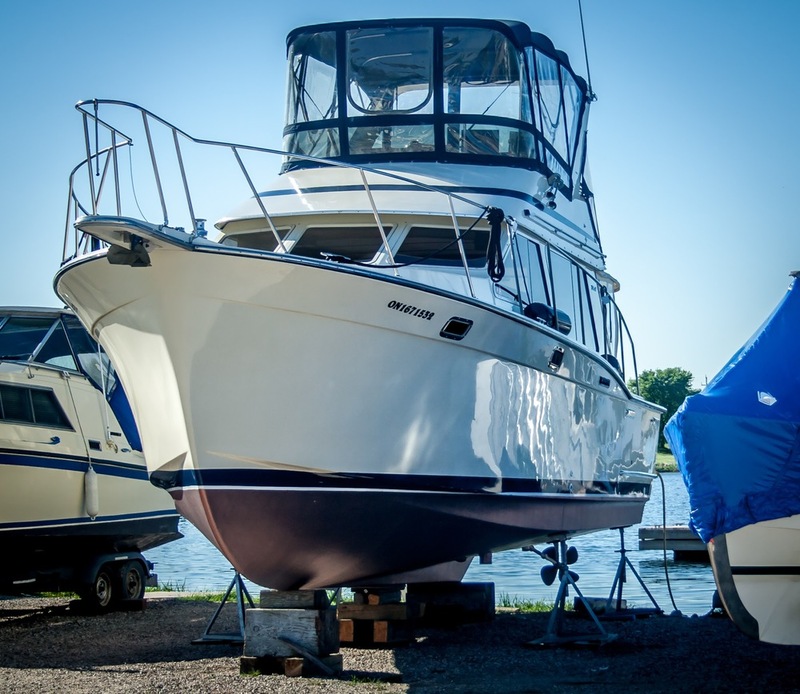 Built on a solid fiberglass hull with a relatively wide beam, the 34 Sport Sedan features a surprisingly open and well-appointed floor-plan with two full staterooms and a head with a separate walk-in shower stall —no small achievement in a 34-foot boat. The traditional teak interior of the Sport Sedan is just one of her appealing attributes. The teak Hi-Low table can serve as a coffee table or raised for a dinner for two. It also opens up for a dining table for 4-6, and can also be moved into the aft cockpit for outside dining. Molded steps at the corners of the aft cockpit provide easy access to the wide side decks leading to a large flat foredeck. Additional features include a bow pulpit, swim platform, and a radar arch. 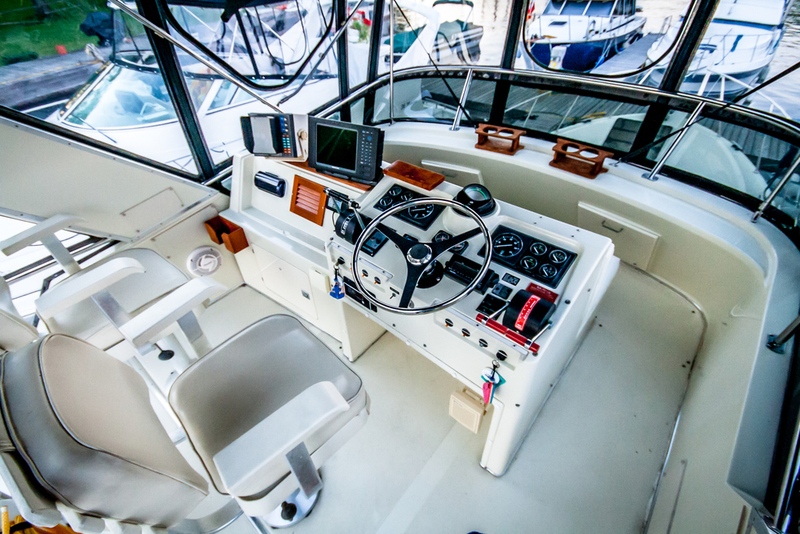 The twin 340hp Mercury gas engines will cruise the Tollycraft 34 at 20 knots and reach a top speed in the high 20s. Tollycraft's 34 Sport Sedan Yacht is built on the Quadra-Lift hull design. Known for its handling, performance and fuel efficiency, this hull makes for a dry ride and dampens roll. Unlike a typical hard-chined hull, the Quadra-Lift hull has a pair of softer chines with a compound curve in between. The top chine, above the waterline, deflects spray and bow wave for a dry ride. The two chines together do a superbjob at raising the hull out of the water when planing, keeping the hull from plunging too deep in heavy seas, dampen roll action and strengthen the hull sides. 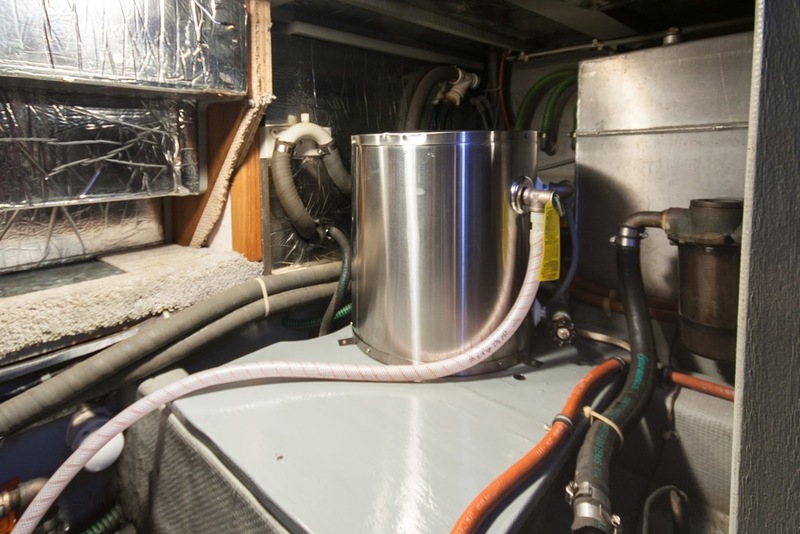 The boat is not only extraordinarily sea-kindly, but is fuel-efficient for its size and weight. She is heavy for her waterline length, giving one the confidence in heavy seas and that bulletproof feeling that comes with every Tollycraft. There is one perk of the Quadra-Lift hull that is rarely talked about but is certainly worth mentioning if you spend anytime at anchor. Most boats, except for maybe full displacement trawlers have hard chines that enters the water at the bow. At anchor, or even at the dock in the right conditions, wave action will carry into these sharp chines and the energy from these waves create whats known as chine-slap. This can happen with the smallest of ripples, and if spending nights at anchor with a clap ringing in your ears every one to two seconds is not your idea of a peaceful night, then this boat is for you. Given the design of the double chine, the top chine never enters the water when at rest, taking the energy from these waves and dissipating it as the wave travels down the hull side at the waterline, making for a silent night at anchor, with the peace you would expect for sleeping. The quality, strength, and longevity of Tollycraft boats are legendary. Most Tollycrafts from the 60's and 70's are still going strong. This boat is no exception. The hull is solid fiberglass with no coring used below the rubrail. Even the stringers, the backbone of any boat, has no wood to rot. These stringers are beefy fiberglass formed over a foam that is non structural. Stringer rot is a death sentence for boats, and the cost of repair is usually not worth it. This Tollycraft will still be going strong even after most boats have seen sent to the junkyard. We believe she was quite possibly one of the nicest Tolly 34s around. You would not believe you are stepping aboard a boat built in 1989. Boats one quarter of her age look and feel older. Specifications are below, but first check out the HD video walk-through of the boat taken summer of 2014. Two 50 Amp shorepower hookups and chords, with Two 30 amp adapters.